YOU CAN SEE THE COMPONENTS MOUNTED BEHIND THE GRILL OF MOST 4X4'S. THIS IS A MODIFIED 77 CHEVY SILVERADO K/20. 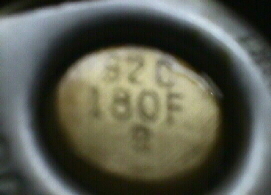 THIS IS A HEATER CORE, FROM A 1980 GMC K/25,WITHOUT AIR CONDITIONING. ABOUT 12" LONG, AND 2" THICK. IT WAS REPLACED BECAUSE THE CLAMPS WERE SO OVER TIGHTENED HOLDING THE HOSES ON, THAT THE TUBES WERE CRUSHED INTO A SQUARE/SEMI "D" SHAPE. 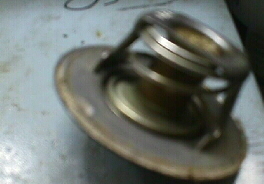 TAKE A LOOK INSIDE YOUR RADIATOR CAP, WHEN IT IS COOL. IF IT'S A LITTLE LOW, YOU SHOULD BE ABLE TO SEE THE "TUBES". THEY MAKE UP THE CORE OF A RADIATOR. THE ENDS ARE REFERRED TO AS "TANKS". MOST V-8 RADIATORS THAT AREN'T ALUMINUM, AVERAGE 3 ROWS OF TUBES, FROM FRONT TO BACK,THROUGH THE CORE. THEY ARE SOLDERED INTO THE TANKS ON THE ENDS. COOLING FINS ENCASE THE TUBES, TO DISSIPATE HEAT FASTER. 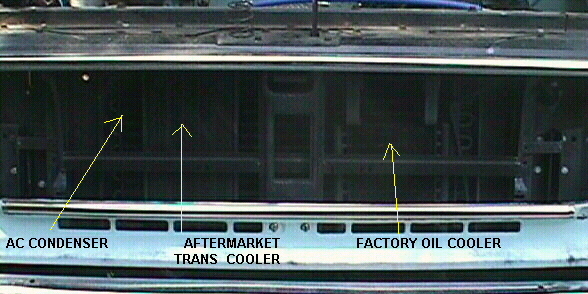 FROM 73-87 CHEVY AND GMC'S CAME WITH A 3 ROW RADIATOR STANDARD ON ALL V-8 SMALL BLOCKS. EXCLUDING THE 400.IT CAME WITH THE SAME 4 ROW RADIATOR, WHICH IS STANDARD WITH THE 454 BIG BLOCK MOTOR. 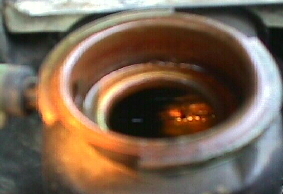 THERMOSTATS REGULATE THE FLOW OF COOLANT THROUGH AN ENGINE. THEY OPEN AT A CERTAIN TEMPERATURE, ALLOWING COOLANT TO FLOW, AFTER THE ENGINE HAS WARMED UP TO THAT TEMPERATURE. THE THERMOSTAT WILL HAVE THE SPECIFIC TEMPERATURE STAMPED ON IT. THIS ONE, HAPPENS TO BE A 180 DEGREE. THE TEMPERATURE GAUGE ON THE DASH, THAT IS OEM, USES A SENDING UNIT WHICH IS SCREWED INTO ONE OF THE CYLINDER HEAD WATER JACKETS, TO SENSE COOLANT TEMPERATURE. IT HAS A SINGLE WIRE GOING TO IT. IT IS REFERRED TO AS AN "ELECTRIC" GAUGE. 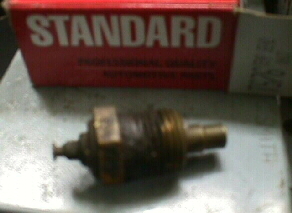 THE OTHER TYPE OF GAUGES, ARE MECHANICAL. THEY HAVE A PROBE, ON THE END OF THIN CAPILLARY TUBING THAT SENSES TEMPERATURE. MUCH LIKE A CONVENTIONAL THERMOMETER WORKS. THE ONLY POWER THEY REQUIRE, IS FOR THE LIGHT INSIDE THE GAUGE, IF IT'S EQUIPPED FOR NIGHT TIME USE.